I honestly do not know how I got through so much of my life without hearing this man's books recommended. But, as I explained in my review of The Warden, all that changed when Mrs Sonnemann introduced me to him and then sent me a little starter pack of my own! I have just now finished the sequel to that first book: Barchester Towers. The differences between The Warden and Barchester Towers are pretty obvious. Barchester Towers is, to begin with, at least three times longer. It also contains everything that I enjoyed about The Warden—but much, much more so. My original thought was that Trollope is the man to read when you are all out of Jane Austen. I would like to modify that view now. Trollope is in many ways different to Austen. He has the same satiric bite, but a somewhat freer hand: no Jane Austen heroine, for example, would box an unwelcome suitor's ears. 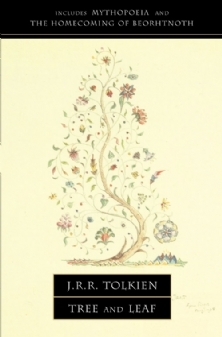 In addition Austen's satire was more directed at people's foibles in private life than their public behaviour and institutions. In short, Trollope is all himself—quirky, compassionate, chatty, and gurgling with quiet humour. Five years on from the events of The Warden, the bishop of Barchester dies and is replaced by the appointment of a Whig government: Dr Proudie, a clergyman with low-church leanings, who comes complete with a Gorgon of a wife and her revolting hanger-on Mr Slope. Hitherto, Mrs Proudie and Mr Slope have seen eye-to-eye in matters of doctrine, but with the bestowal of the bishopric on Dr Proudie, Mr Slope revolts in earnest: Mrs Proudie intends to be the real bishop of Barchester. Mr Slope, installed as the bishop's chaplain, has ambitions of his own and is determined to supplant Mrs Proudie's control over the bishop. Mr Slope and Mrs Proudie's pungent mixture of arrogance and ungraciousness in their intended reforms soon antagonises every one of the existing Barchester clergymen, especially the archdeacon, Dr Grantly. Injury is soon added to insult: Hiram's hospital, without a warden since the end of the last book, is to be given a new warden, and despite expectations that the humble and deserving previous warden, Mr Harding, will be restored to his old home, Mrs Proudie and Mr Slope determine to give the wardenship to another clergyman, Mr Quiverful. Meanwhile, other storms gather on the horizon. Dr Stanhope and his feckless family--conniving Charlotte, useless and idle Bertie, and man-eating divorcee Madeline--return from Italy and settle in Barchester, where Charlotte incites Bertie to marry Mr Harding's wealthy younger daughter and Madeline sets about her favourite pastime, even ensnaring Mr Slope. Despite his passion for Madeline, Mr Slope too decides to marry Mr Harding's daughter. As romantic complications pile up, the war between Mr Slope, Mrs Proudie, and Dr Grantly intensifies. There's only room for one shadow bishop in Barchester; but who shall it be? This book was wonderful: I enjoyed every minute of it, though I read it slowly at first. Trollope's plot is detailed, with a few unexpected turns, and a wholly satisfactory ending. His characters are, as I mentioned in my review of The Warden, wonderfully drawn, with great flaws but also with great compassion. All his good characters have faults, but all his bad characters have their good points. Today, the 25th of April, is Anzac Day, the day that Australians and New Zealanders remember their fallen fighting men. It especially exists to commemorate the day in 1915 that the Australian and New Zealand Army Corps—or Anzacs for short—landed on the Gallipoli Peninsula as part of an Allied expeditionary force. They had been sent to conquer Constantinople, but the plans for the attack—Winston Churchill was responsible—seem to have been ill-made. After a terrible landing, the campaign stalemated and the Anzacs dug in (which is why Australian soldiers will always be called “Diggers”), fighting a long and seemingly pointless series of battles until their evacuation at the end of the year. It was just one more fiasco in the long series of fiascos that was World War I. 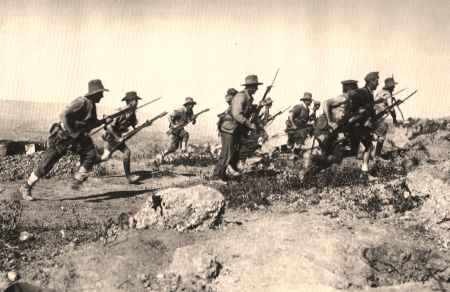 But for Australians and New Zealanders fighting their first war as nations, Gallipoli was a defining moment. Although many English and Frenchmen also died in that campaign—although it ended in evacuation, not victory—that rugged peninsula will always belong to Australia and New Zealand. Other names have become linked to Anzac Day. The charge of the Australian Light Horse at Beersheba, one of the last great cavalry charges of history, was a victory as sudden and brilliant as Gallipoli was slow and deadly. The gruelling seige of Tobruk in World War II Libya became a proud name in our history, especially after German propagandist “Lord Haw-Haw” called its plucky Australian defenders “poor desert rats of Tobruk”--naturally, the Australians adopted the epithet, even striking unofficial medals from a downed German bomber and even after finishing the War and returning home,called themselves with pride the Rats of Tobruk. Erwin Rommel, the German general who failed to conquer the town, is recorded as saying, “If I had to take Hell, I would use the Australians to take it and the New Zealanders to hold it." A year later, in Papua New Guinea, a small body of Australian troops fought the Kokoda Trail campaign: it was a single-file track through jungle and mountains, along which the Japanese hoped to advance in order to take Port Moresby. This would have put them in an ideal position to threaten Australia's more populous southeastern states and make it impossible for the Allies to use Australia as a base. The campaign, one of the very few times Australian territory has ever been threatened, has been called “Australia's Thermopylae”. Of murder shrivel me in death. And taught our manhood how to die. Their own hearts drummed them to the fight. 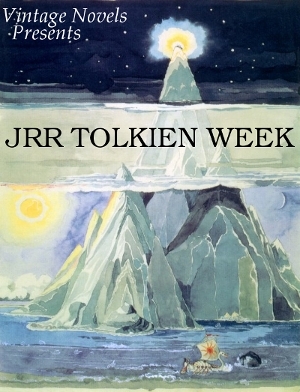 This concludes JRR Tolkien Week. 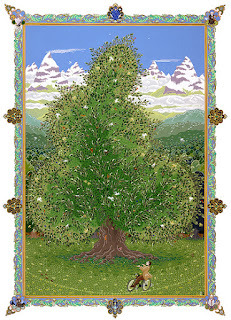 I hope you've enjoyed it as much as I have, as I've tried to demonstrate the way JRR Tolkien's theory of mythopoeia, which I summarised a while ago in a previous post “Mythopoeia and the Charge of Escapism,” together with his Christian convictions, pervade and inform all his works, setting them among the greatest artworks of Christendom. There are other Tolkien books that I have not reviewed here. The Children of Hurin is perhaps my most notable omission—published recently by Christopher Tolkien, it is the full story of Turin Turambar and will be reviewed in due course. The Unfinished Tales is another excellent resource containing fascinating backstory on The Hobbit in “The Quest for Erebor” as well as “Aldarion and Erendis”, one of the few stories from Numenor before the Fall. Unfortunately, the stories in this volume are...you guessed it...unfinished. Hello and welcome to another Feature Week here at Vintage Novels! This time we'll be looking at the works of the author of my favourite book of all time—JRR Tolkien and his Lord of the Rings. What Tolkien did in The Lord of the Rings and its surrounding mythology is unparalleled in the history of literature. Singlehandedly, he did the work of a whole culture: he constructed languages, legends, and cosmology. It was a gargantuan effort—he began work on the legendarium in his late teens or early twenties, and was still hard at work when he died. The extraordinary brilliance of his mind, combined with a disciplined and ardent love for languages of every kind, and a reverent wish to give glory to God in his subcreations, formed the foundation for a life's work that has never been equalled. Tolkien's masterpiece—the epic novel The Lord of the Rings—has spawned a thousand imitators which succeed in reproducing little more than the volume of the story. The imitators do not, or cannot, reproduce Tolkien's overriding concern with what he called True Myth or the evangelium—the Gospel; they cannot even begin to think about using words in the same way that Tolkien could; and they do not have the lifetime of discipline and knowledge to try. We are, after all, talking about a man who, as a young boy in high school, disdained Latin as too easy and opted for Gothic instead. This week I will be taking a look at some of Tolkien's major and minor works. There is no time to review everything, but we'll cover the basics and some of the additional material. Before I begin, I should let you know two things. One, I have probably spent more time thinking about these books than about any other books—and they do reward the study—so there are some very long posts ahead. Two, if you are looking for a critical discussion of the books, you have come to the wrong place. Discussion there will be, but little or no criticism. 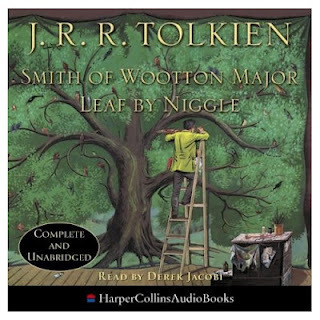 I have spoken to people of every persuasion, from Christians who sincerely believe that Tolkien's work demonstrates a pagan worldview to postmodernist literary snobs who will never be happy as long as someone thinks that The Lord of the Rings is great literature. I cannot join them in their objections, but maybe, as I discuss these books this week, I can demonstrate the underlying worldview and the immense literary skill that went into them. I hope that you enjoy this series. The Adventures of Tintin are the cartoon adventures of an unassuming young man with a ginger tuft of hair, his dog Snowy, and his friend, the irascible old sailor Captain Haddock. Over the course of the 24 books, Tintin stumbles into one adventure, mystery, or treasure-hunt after another, faces every kind of danger, visits every corner of the globe (and even the Moon) and foils dozens of bad guys up to every kind of evil trick. Need I mention how highly I recommend these books? There are many, many excellent things about the Tintin books, and although I cannot hope to cover them all, I shall at least try to list some of them. The art. Hergé drew his books with a combination of beautiful simplicity and elegant detail. Much work and skill went into the cartoons, Hergé extensively researched specific locations, and the result is excellent: understated, clear, unobtrusive, but endlessly pleasant to look at. The characters. Captain Haddock is everyone's favourite—a peremptory old curmudgeon with a drinking problem and an endless vocabulary of insults (“Coelacanth! Bashi-bazouk! Freshwater pirate!). Snowy is also a delightful character, by turns loyal, cowardly, clever, or foolish. Professor Calculus, the scientific genius who is slightly hard of hearing in one ear, is perfectly amusing and harmless as long as you don't accuse him of acting the goat. 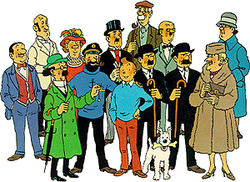 But even Tintin, the oddly featureless main character, is a protagonist it's a pleasure to be around. 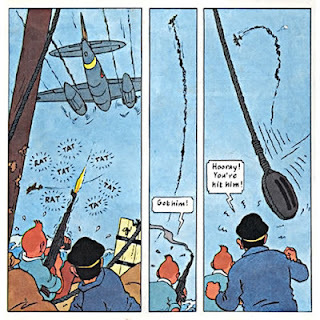 Originally conceived as a role model for Catholic boy scouts, you won't catch Tintin doing anything blameworthy, but that's OK, because he can shoot, fly a plane, knock out a bad guy with one punch, outwit villainous masterminds, investigate mysteries that baffle the police, and drive a tank. He does appear to be about seventeen years old, but that just makes it more fun. One of my favourite Tintin moments occurs in Cigars of the Pharaoh, when Tintin—journeying through a corner of the Sahara—hears a woman screaming and rushes to save her from her villainous attackers (before it turns out that she wasn't really in trouble—he's blundered onto a film set). The plots are also brilliant. After the first couple of Tintin books—which were rambling and a little absurd—the plots began to tighten up a lot and for most of the series they were taut, well-constructed mysteries that somehow managed both to present a coherent, satisfying narrative and to have a cliffhanger moment at the end of every page. The settings are well thought out. As others have mentioned, Hergé was at his best when dealing with complex geopolitical situations, like in The Land of Black Gold (oil in the Middle East), The Calculus Affair (Communism and the Cold War), and The Blue Lotus (the Japanese invasion of China). During the Nazi occupation of Belgium, Hergé was unable to carry on his political commentary, opting for more far-fetched stories. But when he could, he used then-current affairs as much as possible. Some people would find this disturbing. The books are refreshingly free of political correctness. All the characters use guns, drink is a common part of life (though it can be abused), tobacco isn't difficult to come by or stigmatised, women are treated with respect and omitted from dangerous situations, and so on. 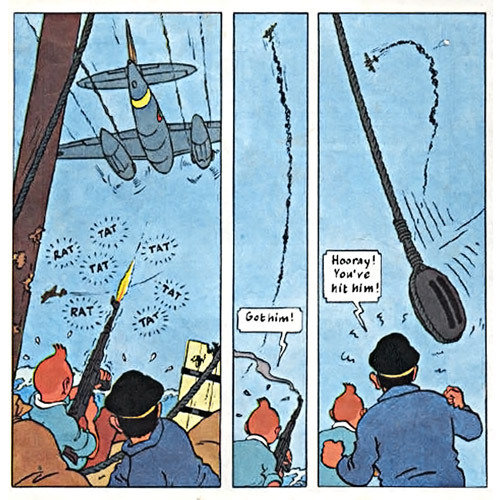 On one page in The Red Sea Sharks, the small boat on which Tintin and Captain Haddock are trying to escape from the bad guys is being strafed by enemy pilots, so Tintin grabs a machine-gun and shoots down the enemy plane. When the pilot survives, they pick him up and end up becoming fast friends. A wonderful intersection of self-defence and charity. The series of twenty-four can be roughly divided into various segments. The formation of Tintin. The first three Tintin books are called Tintin in the Land of the Soviets, Tintin in the Congo and Tintin in America. The first two were very difficult to find when I was young, and I've only read them more recently. They show little research, an undeveloped drawing style, and loose meandering plots. The first two have been more or less dropped from official Tintin canon, for good reason: I am not at all the kind of person to see racists behind every bush, but there's really only one word for some of the escapades in Tintin in the Congo. 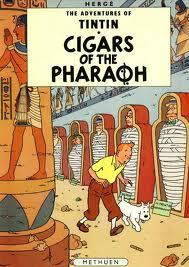 Tintin's adventures with Snowy, from Cigars of the Pharaoh to King Ottokar's Sceptre. A turning-point in the Tintin series came with The Blue Lotus, the sequel to Cigars of the Pharaoh: since he had never been to China, Hergé enlisted a Chinese exchange student as a consultant on the book. They became fast friends, the young man became a character in The Blue Lotus (later to feature in Tintin in Tibet), Hergé learned the value of good research and avoiding stereotypes, and from then on the Tintin books would remain at a very high standard for many years. 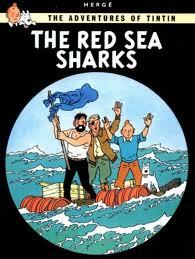 Tintin's adventures with Captain Haddock. Book 9, The Crab with the Golden Claws, would change Tintin forever. Halfway through this book, Tintin collides—literally--with a drunken sea-captain whose villainous first mate has hi-jacked his ship. Tintin and Captain Haddock escape the Karaboudjan together, get lost in the Sahara, and face their enemies in picturesque Morocco. By the end of it, Tintin has not just busted a gang of drug-runners—he has found a new friend. From then on, the pair of them would be a team. Tintin's deconstruction. Books 20 to 24 saw Hergé do something I have never seen happen before (even Arthur Conan Doyle, becoming tired of Sherlock Holmes, simply killed off his detective). He began to destroy his creation, at first just playing with it and then actively undermining it. Tintin in Tibet showed the first signs: in this epic man-vs-wild quest, the only villain turns out to be just misunderstood. This was followed by The Castafiore Emerald, considered by some to be Hergé's masterpiece: a story in which very little happens, there is no mystery, there are no bad guys, and yet in which the tension is kept up on every page. Both of these books were interesting and completely successful experiments. However, this was just the start of a derailment into the downright bizarre. Flight 714 was, perhaps, no weirder than the Peruvian adventures, but the whole point of the book seemed to be to take two of the series's most iconic villains—Rastapopoulos and Allan—and make them as ridiculous and unintimidating as possible. Finally, in the last completed book, Tintin and the Picaros, Hergé began to deconstruct his heroes themselves: Tintin loses his taste for adventure, Haddock loses his taste for whiskey, and the two of them end up helping with a meaningless revolution. What caused this sudden turn into deconstruction? Was it a full-blown author breakdown or simply boredom? Tantalising questions. The unfinished Tintin and Alph-Art, published with notes as far as it went, seemed to be ready to continue the process of change and deconstruction, though not (perhaps) in such an extreme fashion. 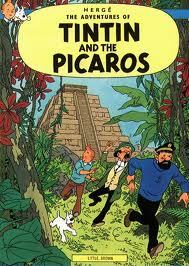 Besides the sudden swerve into self-deconstruction at the end of the series, there are a couple of other things to be aware of—Hergé appeared to have a fascination with the occult which cropped up once or twice, most notably in The Seven Crystal Balls and its sequel, Prisoners of the Sun, with its ancient mummy and voodoo dolls. Tintin books can be found at most Australian libraries and should be increasingly available in the US as well. I highly recommend them. I have seen the Steven Spielberg/Peter Jackson film The Adventures of Tintin: The Secret of the Unicorn and thoroughly enjoyed it despite a few flaws. Find a more thorough review of the movie, together with some good comments on the books, at Outside Hollywood. Well, I will once again interrupt your regularly-scheduled book reviews for a post. I was tagged to answer a set of interview questions over at the blog of My Lady Bibliophile--which I have been reading with great enjoyment since it started up at the beginning of this year! Pop on over and say hello!